VirtualVTR provides a controllable and synchronisable QuickTime play-out channel for your media workflow. Supporting most formats of QuickTime compatible SD, HD and UHD natively without the need to transcode, VirtualVTR plays original and edited media from your shared storage directly to air, including Quicktime reference movies. Available in Standard and Pro varieties, VirtualVTR Pro may be controlled using a wide variety of methods including Sony P2 protocol (also supports Odetics extensions), TCP/IP (using VirtualVTR Remote control application or your custom solution), MMC, USB keyboard or Jog Shuttle controller, GPIs, or timecode chase. All control protocols can be active simultaneously. Since its first version was released in 1995 VirtualVTR has been used by leading global broadcasters for critical on-air applications such as live news and sports. VirtualVTR has also been used extensively for projection at live events like Live8 and concerts by the world's biggest artists. VirtualVTR is the industry standard solution for playback of QuickTime movies used by Film mix stages like Disney and Warner Brothers. Now in its tenth generation of development, VirtualVTR continues to be a uniquely powerful and flexible solution for all kinds of controlled and synchronised playout. Pairs of VirtualVTR systems can also be linked in a 'buddy' configuration for redundancy, where the second system automatically chases the first, frame accurately, and in the event of failure of the primary system, the backup system will already be playing back the program in sync, ready for the director (or fail-over monitor) to switch to the backup. VirtualVTR outputs via HDMI or Video devices such as AJA, BlackMagic Design and Matrox. VirtualVTR Pro also supports fill and key SDI output with compatible hardware and source movies. Most VirtualVTR systems are based on MacMini dual i7 CPUs, although in many cases a dual i5 Mac Mini can suffice. Control video playback using Midi (Midi TimeCode for sync, Midi Machine control for jog/shuttle/locate), 9-pin, USB Jog Shuttle Wheel, or Keyboard Controls, individually or all simultaneously. VirtualVTR Pro also support TCP/IP Control. High performance video playback, supporting all formats including PAL, NTSC, 720p, 1080i, 1080p, UHD, 24 FPS, etc. Supports all QuickTime codecs, including ProRes. Instant Locate to any part of the video, with 9-pin, MMC, mouse or manually entering timecode value. VirtualVTR's internal synchroniser chases incoming timecode - either LTC or MTC. Typical lock time is well under half a second. 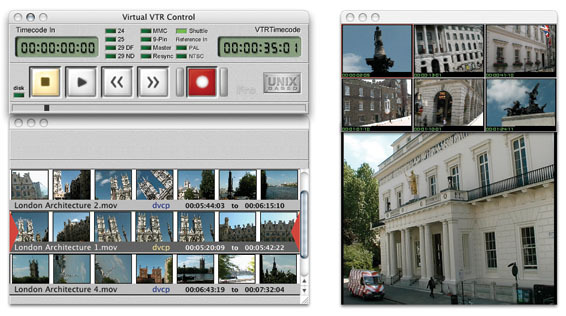 VirtualVTR Pro can also be slewed to lock with Machine synchronisers and edit controllers. 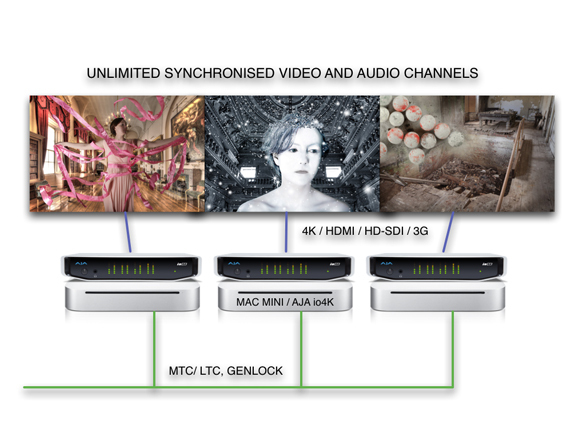 VirtualVTR Pro can act as an MTC timecode master to synchronise multiple channels for video walls art installations etc.